You may have to make other adjustments if your pet can’t get around very easily, such as bringing food and water to her. Make those non-slip rugs and mats pull double-duty and bring them with you at feeding time; they’ll catch the mess and keep your pet’s area clean. Your pet probably already has a favorite place to lounge and nap, but if it’s on the sofa or the bed, remember that she will have a tough time getting up and down. Most veterinarians recommend that you confine your pet to one room so she doesn’t overexert herself, but if her favorite resting spot is in a room with high surfaces she usually gets on, you may have to make a few adjustments. Depending on the type of surgery, ask your veterinarian if a small animal heating mat could also aid in your pet’s recovery. Heating pads provide a gently warm lying area that, at full power, is 30-35° above air temperature. Remember to consult your veterinarian about proper surface temperatures of your heating pad and install a rheostat or power control to regulate the temperature of the heat pad. Keep them comfortable: Make sure your pet’s resting area is clean, warm and in a quiet space. Check the area for drafts to ensure they stay relaxed. 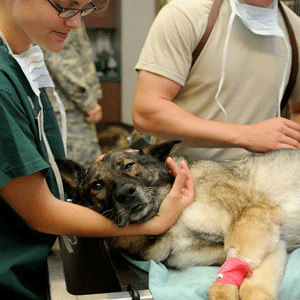 Consult your veterinarian about the use of a heat mat to aid in the recovery process. Minimize activity: In many cases, stitches come out about ten days after surgery but watch for problems like redness, soreness, swelling, and discoloration. If anything doesn’t look normal, call your vet’s emergency number. Posted with permission. For the original article, please click here.